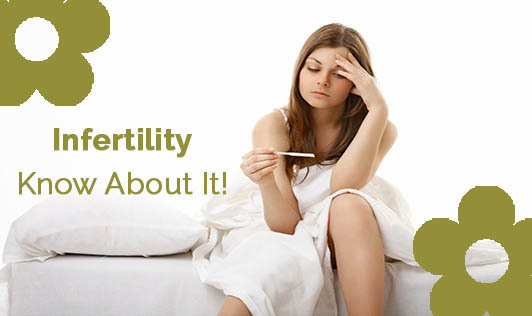 Infertility - Know About It! Infertility refers to the biological inability of a person to contribute to conception. Infertility may be caused due to many factors and it differs for men and women. It can either exist in one of the partners or in both of them. Risk factors of infertility depend upon age as the main factor, smoking, alcohol, obesity, metabolic syndrome, infections, and mental stress. The cause of infertility in women includes ovulation disorders such as PCOD, thyroid imbalance, hormonal changes, premature ovarian failure and problems in the uterus or the fallopian tubes. The cause of infertility in men depends on sperm count, sperm mobility, sperm shape etc which might be caused due to testicular infection, Hypogonadism or genetic abnormality can also be its reasons. Other than these known reasons, there are many unknown ones that still need research. The causes of infertility are often treatable with proper medication, nutrition and lifestyle modification. • Weight reduction to a normal body mass index. • Consumption of low glycemic index foods can improve fertility by controlling blood sugar and insulin levels. • Foods rich in protein especially from plant sources can help in better productivity. Fibre rich foods, vitamins and minerals may have a surprising benefit on the reproductive system. • Monounsaturated and polyunsaturated fats help improve the body's sensitivity to insulin, which in turn affects the fertility of an individual. Avoid smoking, alcohol intake and drugs. • Avoid foods that are rich in trans-fats/saturated fats and sugar in processed foods. • Daily physical activity such as swimming, playing a sport or using the gym can also help improve fertility. • Meditate or perform yoga to reduce stress. • Sleep for about 6-7 hours daily. These are the minor modifications one needs to make in order to change their lifestyle to a healthier one and improve the chances of fertility.